20 cm lxi, 261 p.
Reprint. This ed. originally published: 1994. 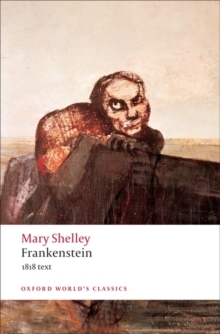 Frankenstein was Mary Shelley's immensely powerful contribution to the ghost stories which she, Percy Shelley, and Byron wrote one wet summer in Switzerland. Its protagonist is a young student of natural philosophy, who learns the secret of imparting life to a creature constructed from relics of the dead, with horrific consequences. Frankenstein confronts some of the most feared innovations of evolutionism: topics such as degeneracy, hereditary disease, and mankind's status as a species of animal. The text used here is from the 1818 edition, which is a mocking expose of leaders and achievers who leave desolation in their wake, showing mankind its choice - to live cooperatively or to die of selfishness. It is also a black comedy, and harder and wittier than the 1831 version with which we are more familiar. Drawing on new research, Marilyn Butler examines the novel in the context of the radical sciences, which were developing among much controversy in the years following the Napoleonic Wars, and shows how Frankenstein's experiment relates to a contemporary debate between the champions of materialist science and of received religion.